I suppose I am a very sheltered lady, as I was not even aware of this gourd until this year (2013), let alone that it is a substitute to carb-and starch-ladden pasta. While I was in New York, I spotted some spaghetti squash on sale when I was at the grocery store, and was like, "Let's give this a shot." My hotel room had a stove top, but not an actual oven, so I went en route of boiling it. I gotta tell you, scooping out the squash, after it had been cooked, and watching it form into these skinny noodle strands was like MAGIC. I had way too much fun by myself. I AM A WIZARD! I never would have thought a squash could replace pasta. I had two bowls and did not feel guilty, and I didn't go into a food coma afterwards either. Although I am late in the game to discover this alternative to refined flour, it has quickly been adopted into my new cleaner lifestyle, and I had to share in case you are like me, and have not yet worked with this amazing food. - Preheat your oven to 350 degrees. If you're boiling the squash, bring a large pot of salted water to a boil. - In the meantime, cut your spaghetti squash in half, lengthwise, and scoop out seeds/strings. - Pour 2 cups of water into the baking dish and place the spaghetti squash in the dish face down. Bake for 35 mins. If boiling, place the squash halves face-down into the boiling water. Boil for 15-20 mins. - Times may vary, depending on the size of the squash, so monitor by checking for tenderness. Your fork should easily be able to slide into the flesh, when it's ready. - Once it’s tender, remove from oven or pot and let it cool until you can handle it with your hand or oven mitt. - Then, take your fork and drag it down the inside of the squash half. It will incredibly start shredding into strands, that act just like spaghetti! If boiling, place the "noodles" into a strainer to rid any access water. Distribute the spaghetti squash strands into serving bowls, then add you favorite spaghetti toppings. 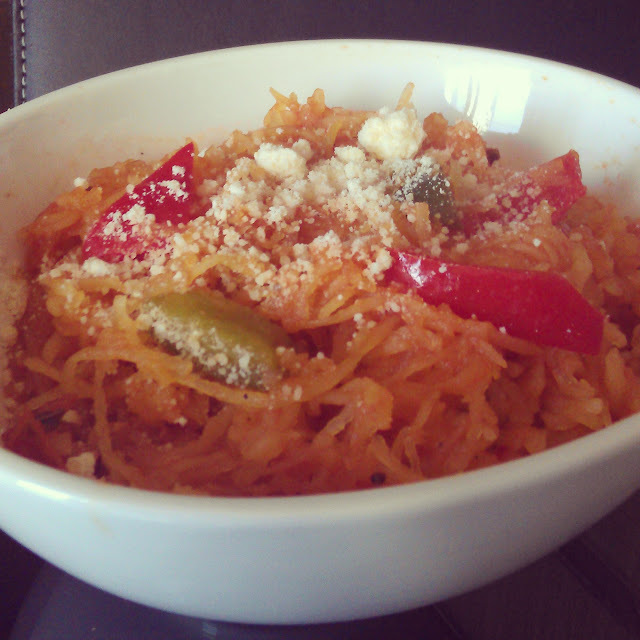 If you're watching your carb intake, Google "spaghetti squash recipes" for many healthy alternatives to your favorite pasta dishes!